NHL News : Michael Haley pulls Ryan Reaves off the bench and forces him to fight! Michael Haley pulls Ryan Reaves off the bench and forces him to fight! When an enforcer wants to fight in the National Hockey League, there is very little that will stop him from accomplishing his goal. 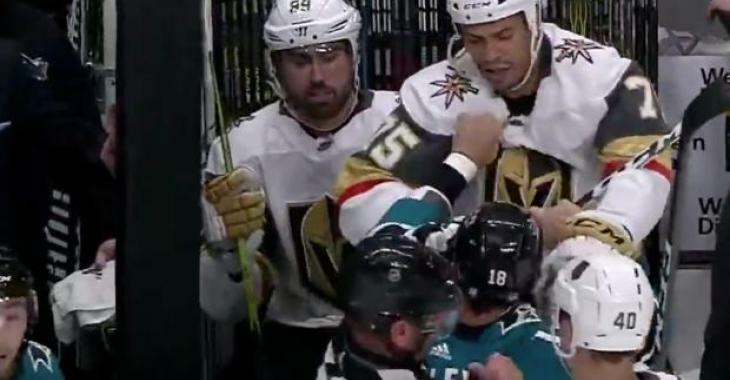 San Jose Sharks' Michael Haley went as far as trying to pull Golden Knights tough guy Ryan Reaves off the bench on Monday night in order to get him to fight during Vegas' 7-3 win. Why did Haley go this far?! Well, the Sharks enforcer wasn't happy when his teammate Melker Karlsson was viciously rammed into the boards by Reaves right in front of the San Jose bench. Reaves took a quick look at his victim before going off on a line change, but Haley did not care where he was going. He wanted revenge for his teammate and went straight to the bench to pull Reaves off it and force him to fight by throwing punches at his face. Haley ended up taking a roughing penalty on the play. And as you would expect, Reaves laughed it off as only he can do. Games are always a riot when the Golden Knights and Sharks face off and the exciting thing is that these two teams could meet up in the first round of the Stanley Cup Playoffs.